It’s what travelers can only dream of, a show to remember, an opportunity to experience culture, tradition and sheer beauty first hand. The Royal Kathin Barge Procession down the Chao Phraya River (‘River of Kings’) to Wat Arun temple, is one of the grandest spectacles in the Kingdom of Thailand, an ancient tradition revived by His Majesty King Bhumibol Adulyadej in 1959. This is the first procession after the diamond jubilee celebrations to mark the 60th anniversary of HM King Bhumibol’s accession to the throne in 2006. The Praratcha Phithi Phra Yuha Yatra Cholamak (Royal Waterway Procession) will celebrate HM King Bhumibol’s 84th birthday. Although the birthday is on 5 December 2011, the Royal Thai Navy will be organizing a Royal Kathin Barge Procession on 22 October 2011, when members of the royal family will be visiting a royal temple to present offerings of saffron kathin robes, food and other necessities, to the monks. 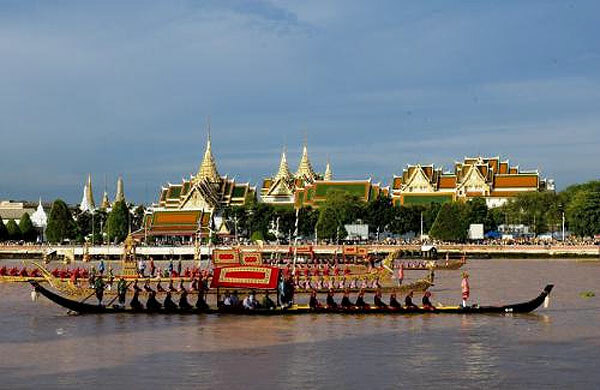 The water-borne royal kathin procession on 22 October will consist of a flotilla of 52 traditional-style barges arranged in five columns, based on a battle formation from ancient times. The royal barges of Thailand are the last of their kind in the world, and seeing them in a procession is more than a tourist attraction: it’s culture, tradition, and history all in one. It is also a show worthy of a Hollywood production of its own. The five-column flotilla stretches 1,280 metres in length and 110 across. A total of 2,200 sailors from various units within the Royal Thai Navy will serve as oarsmen.